These roomy café tables have support bars in the middle, so people can slide in from either side and sit down. This configuration makes them the right choice for the middle of a room. 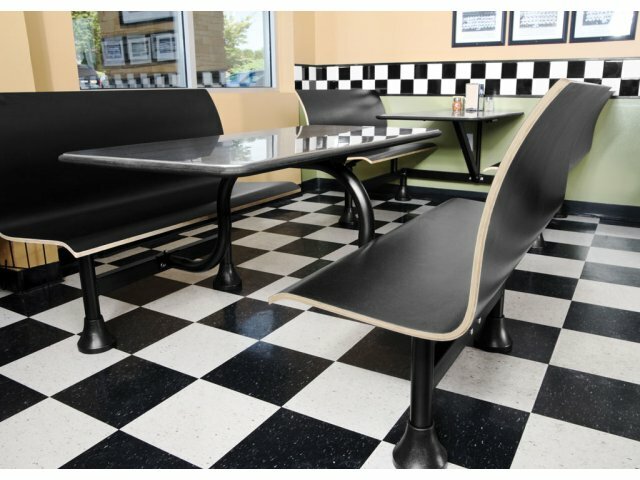 Bring back the good old days with Retro-Bench Café Tables. Vintage style is executed beautifully through convenient design features and durable construction. 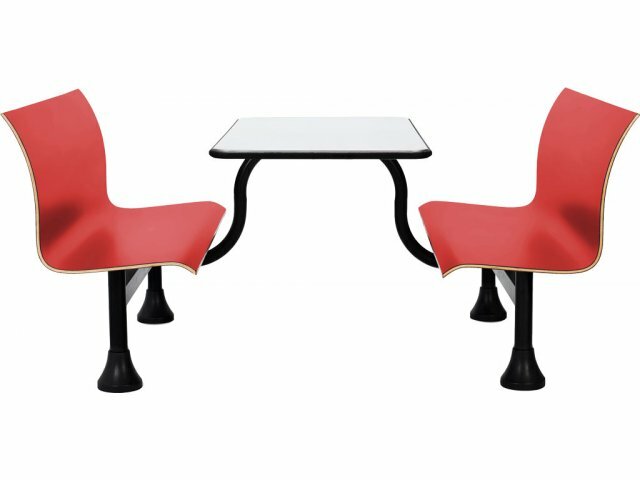 Brightly-colored, full-length benches constructed from fully-laminated plywood are easy to slide onto for comfortable seating. Medical-grade, stainless-steel tops have a sleek appearance, and remain germ-free even when they are used daily. Adjustable foot glides on each café table leg make it easy to compensate for uneven flooring. 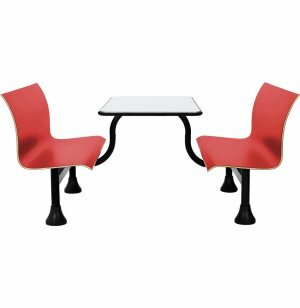 This appealing, classic design and its modern features are sure to spice up any eating area. Stainless steel has a sleek appeal and great corrosion resistance. Middle Arrangement: Center supports enable people to enter from both sides. Extra Room: Extra-deep tabletop provides more space for trays and food. Sturdy: High-pressure laminate benches and stainless steel tabletops are tough enough to endure the daily rigors of any cafeteria. Vintage Appeal: Retro-style benches have an undeniable classic charm. Health Conscious: Medical-grade, stainless-steel tabletops maintain a germ-free environment. Sturdy Construction: Fully-laminated plywood benches can support up to 500 pounds. Adjustable Height: Foot glides on each leg are individually adjustable. Spacious Seating: Full-length seat with no arms allows you to stretch out while you sit. Aesthetic Design: A plastic cap covers the bottom of each table leg, concealing screws. Permanent Option: Tables can be permanently mounted to floor.